Vegetable growers concerned about low-temperatures this winter are being encouraged to use frost cloths or ‘fleece’ with a new Ausveg study proving the material is effective in saving crops from the cold. During the study researchers from Australian vegetable industry representative body Ausveg tested frost cloths, or ‘fleece’, which are made of spun bonded polypropylene. The material acts like a blanket over the crop and traps warmth radiating from the soil and increases the humidity and deflects sinking columns of cold air. 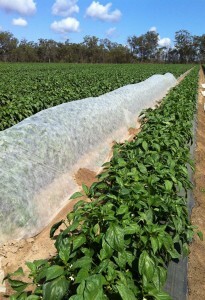 The research found that frost cloths can be an effective weapon in protecting crops form frost and cold weather. The cloths were discovered to work particularly well in protecting young plants. “Many growers choose not to plant crops that are susceptible to low temperatures during winter,” said Ausveg spokesperson Dimi Kyriakou. “However, the use of frost protection materials such as commercial ‘fleece’ may provide an opportunity for growers to address the demand in the market for cold-sensitive crops during the winter period,” said Kyriakou. “This ‘fleece’ can help young plants to establish more quickly, as it can protect them from wind damage as well as insect contaminants during the coldest months of the year,” she said. Ausveg is an industry representative body representing over 9, 000 Australian vegetable growers. The research is published in the March/April edition of Vegetables Australia, a magazine published by Ausveg.